Belize's property market is booming, thanks to a surge in tourist arrivals. House prices are back at or above pre-crisis levels.&nbsp;Property prices in Belize, especially in favourite locations such as Ambergris Caye and Placencia, have risen by double-digit figures annually during the past three years, according to local real estate experts. Even in the country's rugged jungle areas, house prices are rising strongly, thanks to growing interest from foreign buyers. In the rural Cayo District, property prices have risen by about 5% to 7% annually over the past five years. For instance, a 15-acre coconut farm, which was recently sold for US$225,000, had changed hands for just US$165,000 five years ago, said Macarena Rose of Keller Williams Belize. Actually, it is difficult to be sure how much house prices have changed, as there are no official house price figures. However, realtors estimate that house prices declined by as much as 25% to 30% during the global economic crisis. Property rebounded strongly in 2012, and has continued to rise since then. Outside buyer interest in Belize rose rapidly from 2000 to 2007, partly due to the passage of the&nbsp;Retired Person Incentive Act (RPIA) in September 1999, and to the tourism boom.&nbsp;Tourists flocked to Belize's natural wonders - beautiful beaches and tropical forests, plus ancient Mayan temples. From 2003 to 2007, property prices in coastal and tourist areas rose by as much as 30% annually, while prices of inland properties rose by around 15% annually, according to local real estate agents. Yet the average price for luxury homes in Belize is still less than US$1 million, well below the US$2 million average price of luxury home in some other Caribbean destinations, according to SANCAS Realty. Residential rents also remain surprisingly low. The average rent for a one-bedroom apartment in the city center is US$350 per month while three-bedroom apartments are offered for around US$600 per month. Rents for apartments outside the city are about 25% to 35% lower. "As recently as two years ago most buyers wanted a place to retire and slow down," said Ceiba's real estate agent Joshua Lohr. "Now most buyers are looking for investment opportunities hoping to tap into the growing tourism and rental markets." Ambergris Caye and Southern Belize - Placencia - continue to be the two most popular areas for foreign homebuyers.&nbsp;Ambergris Caye&nbsp;has the most expensive housing in Belize, because tourists and expats are attracted to the beauty of the Barrier Reef. One- to two-bedroom oceanfront condominium units are priced at about US$300,000 to US$600,000, while three- to four-bedroom oceanfront houses are priced around US$1 million. More affordable houses are found in the south, especially in the&nbsp;Placencia Peninsula&nbsp;and nearby areas such as&nbsp;Sitee River, where residential properties are usually priced 40% lower than those on Ambergris Caye. One- to two-bedroom oceanfront condominium units are priced between US$200,000 and US$450,000. Some expats choose to settle in areas close to the border with Mexico or Guatemala.&nbsp;Corozal Town&nbsp;in the north (bordering Mexico), and the&nbsp;Cayo District&nbsp;in the west (bordering Guatemala) are some popular places for expat retirees. In San Ignacio, Cayo District, the average price of luxury homes is around US$500,000. The number of affluent individuals seeking property in Belize has continuously increased in recent years, attracted by the country's "Qualified Retired Persons" (QRP) program and the relatively low prices of luxury homes in the islands. Sales of existing houses in Belize have risen by about 15% to 20% in the past three years, according to local real estate experts. For instance, in the inland Cayo District, Ceiba Realty Belize sold more property in 2017 "than in the five previous years combined," said Lohr. "Many international buyers are just beginning to discover the potential opportunities of investing in this tiny central American nation bordering the Caribbean Sea," said Christopher Todd of SANCAS Realty. "Savvy buyers can find tremendous value in Belize, especially on the Placencia Peninsula in the Stann Creek District, and in the Cayo District to the west." Foreign nationals represent 95% of homebuyers in Ambergris Caye, in the Cayo District, and the Placencia Peninsula, according to SANCAS Realty. Most foreign buyers come from the United States. There are direct flights from numerous U.S. cities, including Houston, Chicago, Dallas, Miami, Charlotte, Atlanta, Los Angeles, and Newark. There is also a growing interest from Canadians, Britons, Italians and Russian investors. "The mid-term potential of the Belize real estate market is absolutely phenomenal," said Todd. "The consensus opinions from our experts all paint a promising picture for those seeking to invest in Belize over the near-term." Hon. Santiago Castillo, Belize's Minister of State for Economic Development, says: "We are extremely bullish on the appreciation value of northern Ambergris Caye over the mid to long term. We expect to see considerable new construction in this area over the next five to ten years as the northern area captures the attention of high net worth individuals and becomes the new epicenter of luxury real estate for the island." Earlier this year, international hotel chains Marriott and Four Seasons announced their upcoming hotel and residential projects in Belize. Most property transactions are done in cash, as Belize's banks charge high interest rates. The Belizean dollar is tied to the US dollar at a fixed exchange rate of 1 USD = 2 Belizean dollar. There are no restrictions on foreigners purchasing real properties in Belize. 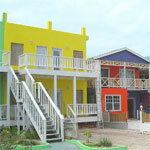 House prices in Ambergris Caye remain stable, with an average selling price of US$450,000. Last year houses sold for an average of US$ 420,000. This year, included condos in our research. Condos in Ambergris Caye sell for US$2,660 to US$3,330 per square metre. Rental Income: Rental income is considered as business income, and is taxed gross at a flat rate of 3%. Capital Gains: There is no capital gains tax in Belize. Inheritance: There is no inheritance tax in Belize. Residents: Residents are taxed at a flat rate of 25% on their employment income. Income from other sources is subject to business tax, wherein the applicable tax rate depends on the classification of the income. Roundtrip transaction costs are around 14% to 19% of the property value. The stamp duty is 5% with the first BZD20,000(US$10,000) tax-exempt. Real estate broker's commission is typically 6% to 7% for houses and 10% for land. Sale of new properties is subject to 10% General Sales Tax. Rent: The initial rent can freely negotiated. The Rent Restriction Act, however, limits rent increases to 10% annually or at a level mandated by the district Rent Assessment Board. Tenant Security: Non-payment of rent and sub-letting without the landlord’s knowledge are grounds for eviction. Landlords, through a court order, can forcibly enter to reclaim the property from tenants, and claim compensation for damages and unpaid rent. Belize is a low income country (GDP per capita of US$4,806 in 2017), and a high birth-rate. Tourism, fisheries, agriculture, and manufacturing dominate the economy. Belize’s economy grew by a meagre 0.8% in 2017, after a contraction of 0.5% in 2016 and GDP growth rates of 3.8% in 2015, 4% in 2014, 0.7% in 2013, and 3.7% in 2012. In the first four months of 2018, Belize’s total exports dropped 19.6% from a year earlier, while imports rose by 1.3% over the same period, according to Statistical Institute of Belize (SIB). This was mainly due to the collapse of sugar shipments amidst falling commodity prices. The economy is expected to expand by 1.8% this year and by another 2% in 2019, according to the International Monetary Fund (IMF). In 2017, the total number of stay-over visitors in Belize was 389,158 people, up 9.1% from a year earlier and the highest in more than two decades, to according to Belize Tourism Board. Cruise ship arrivals also increased 0.9% to 912,809 people. “Belize’s tourism is so unique and diversified. The exceptional increase in tourism arrivals is a reaffirmation that the country continues to be a growing, viable and a must-visit destination in Central America and the Caribbean,” said the Belize Tourism Board. During the first quarter of 2018, stay-over visitors surged by 22.5% y-o-y to 149,761 people while cruise ship passengers increased 4.6% to 382,430 people. Unemployment stood at 9% in 2017, down from an average of 11% from 2000 to 2016. However, the country’s jobless rate is expected to rise again to 9.8% this year and to 11.6% in 2019, according to the IMF. In April 2018, inflation stood at -0.5%, from -0.6% in March, -0.5% February and 0.9% in January, based on figures from SIB. Inflation averaged 1.8% from 2000 to 2017. Belize is a former British colony, and won full independence in 1981. In February 2008, the left-leaning United Democratic Party (UDP), which had led the country to independence, won the general election, unseating the centre-right People's United Party (PUP), which had been in power for 10 years and had been rocked by allegations of corruption. The UDP’s leader Dean Barrow is Belize’s first black prime minister. Prime Minister Dean Barrow was re-elected for an unprecedented third five-year term in office in Belize in November 2015, and his UDP party retained its power.